Hello friends! Welcome to another book discussion that really should have taken place in December. I feel like I've said it before but blog planning is no joke. I have so many ideas and good intentions to stay caught up and then I'm falling behind once again. I'm working on getting us on a solid posting schedule (2-3 times a week) and mixing up our posts so we don't have only book posts every time, even though our blog is mostly book based. This discussion focuses on Simon vs. The Homo Sapiens Agenda, one of the best books of 2015 in our opinions. Let's get this discussion started so we can let you know all the reasons you need to get your hands on this book ASAP! December book club discussion number 1 commences now! Simon vs The Homo Sapiens Agenda was such an amazing pick to end the year on! What was your favorite part of this book? Oh man, it is really hard for me to pick a favorite part of this book because I loved it oh so much. But I think I would pick that defining moment when Simon and Blue both come out to their parents. They have such different home lives but both of their coming outs were met with so much love, support and respect, especially within a small town setting. That was super heartwarming! What about you? Agreed 100% on the coming out stories. It was so interesting to see how each of them played out. As a straight person who has never had to declare her sexuality one way or another, it was also a little heartbreaking reading their struggle on how to come out to family and friends and if that would change those relationships. I think my favorite part was just how realistically Simon and his friends were portrayed. They never felt like caricatures of real teenagers and even as someone pushing 30 I felt they were very relatable and people I would want to be friends with! Oh man, I agree so hard about how heartbreaking that is. Also as someone who hasn't never had to declare her sexuality, that is something we take for granted because that is a legit struggle from some. I'm hoping our society gets to the point where people realize sexuality, like anything else, is part of a spectrum. I also agree with you about the teenagers coming off super realistic. Kids aren't perfect and this book did a great job of portraying kids in cliques and friends who actually disagree and sometimes fight which was refreshing. Lives aren't perfect, people! sexuality right away, which is something I know for myself I should work on more. I think this really was a great book that was able to portray the awkwardness of high school and adding the element of coming out was such a great layer to add. I think especially with it being a small town vibe, it was easy to see their reluctance to really declare their sexuality. I also loved that the kids were not perfect, even Simon was a jerk sometimes and it was refreshing to have multi-dimensional characters who felt real and relateable. We are all jerks sometimes and no one is ever perfect. What did you love about the romance aspect of this book? I was in love with the sections of Simon and Blue's email correspondence thrown in there. Oh man, that is also my favorite quote from the book. It just rings so true to me. Hopefully as the LGBT community continues to gain rights the sexual norms will start to drop away too. People are just people and shouldn't be defined solely based on their sexuality. That is just a part of what makes them who they are. But yea, from growing up in a small town, I can definitely see the reluctance of wanting to become the latest topic of gossip and/or reticule that can come along with ignorance. I am always a sucker for email correspondence in books and this book was no exception. I loved watching their relationship grow even though they didn't know who they were corresponding with exactly, other than they went to the same school. Towards the end it became pretty easy to pick out who Blue was, as least from a reader's standpoint. I can see how it took a little longer for Simon to figure out, but he was way closer to the situation and was also putting his own hopes on who it could be which I could see being tricky to try to guess who the correspondent was. But I thought their love felt super authentic. They were dealing with issues I've never even dreamt of dealing with in my life and after some encouragement they both were able to conquer their fears and find acceptance at the same time. That was super magical to me. I seriously just wanted to hug my kindle once I finished this one. Yes! I felt the relationship grew in such an authentic and realistic way! It was definitely easy to guess who Blue was towards the end, I felt like it definitely captured the uncertainty and anxiety that goes along with first love and first crushes in general. It was such a heartwarming read that made me feel like my smile was going to break my face in two! To wrap it up, what would you rate Simon vs. The Homo Sapiens Agenda? I give Simon vs. The Homo Sapiens Agenda ALL THE STARS or 5 stars on a normal rating scale. I devoured this book in one day and heart emoji eyes for days. This is one of those books I can see myself rereading in the future! 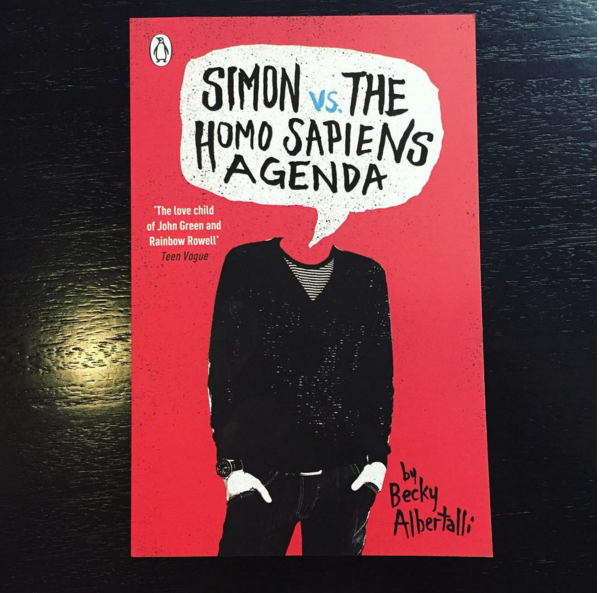 It was a great debut book for Becky Albertalli and I will now be picking up anything else she releases. What does it rate in your world? I also was a heart eye emoji for this book and it got the full 5 stars from me as well! I devoured it in a day and was just so happy after it was over. Becky Albertelli is a must read for me from now on. I agree that this book is one I can see myself rereading and maybe even buying a physical copy of. I'm so glad we read this and loved the point of view. One of the best reads of 2015 for sure! YES! Get this book in your life ASAP!